The city has since allowed two scooter rental services – Scoot Networks and Skip – to participate in a yearlong pilot program, which launched on October 15th. Within hours of the launch, the companies witnessed a host of illegal behaviour, such as residents toppling over scooters or riding along the footpaths. The day after San Francisco lifted its temporary ban on electric scooters, residents have already taken to knocking them over, parking illegally, and riding on footpaths instead of bike lanes. The incidents are further proof of the difficulties surrounding the new form of transportation, which first appeared on the city’s streets in March. 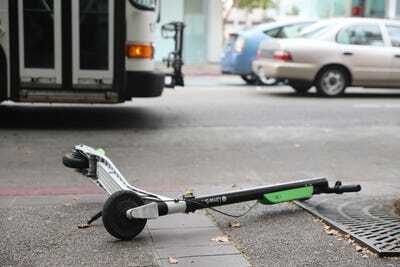 In an overnight avalanche, three companies – Bird, LimeBikes, and Spin – began deploying their electric scooters in San Francisco to the chagrin of local residents. “A few weeks ago, I had not noticed any electric scooters in SF. Now you can’t exit a building without tripping over one,” M.G. Siegler, a general partner at Google’s investment arm, GV, tweeted in April. Part of the problem was that the dockless systems had allowed for scooters to be discarded along the streets. This created a hazard for residents, who found their footpaths clogged and their building entrances blockaded with a mass of vehicles. The city sprung into action, demanding that the three scooter companies suspend their operations until they were awarded a permit. The companies, which did not seek permission before deploying their programs, were then asked to submit a business plan for ensuring riders’ safety and keeping footpaths clear. While both Scoot and Skip have devised systems for flagging unlawful activity, they will have to prove that these systems work before securing a permanent spot on the city’s streets.